Guide.ash is a relay script that will give advice on playing KOL. It details how to complete quests you're on, and what resources you have available. During an ascension, it will inform you what you need to know to complete your ascension as quickly as possible. Faxing, the daily dungeon, acquiring a wand, where to go next. The script runs side-by-side with KOL. Leave the window open, and it'll update as you go along. The script will inform you of various resources you have - free runaways, hipster fights, semi-rares, dailies, etc. - and ideas on what to use them on. There is preliminary support for the florist friar and what to pull. Once it's installed, look in the relay browser. 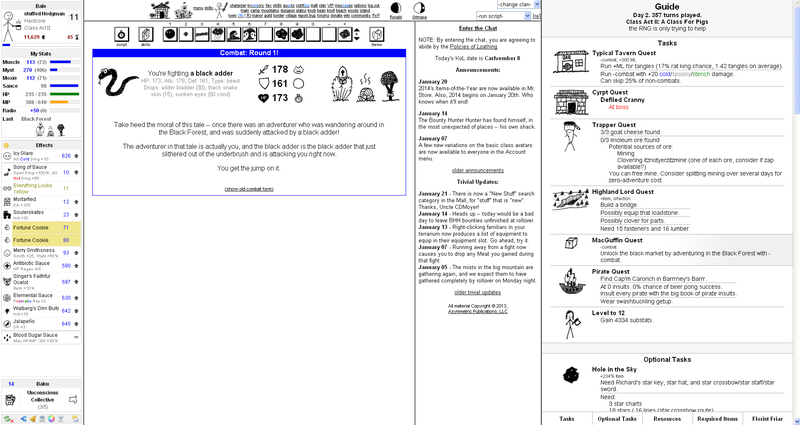 In the upper-right, there will be a "-run script-" menu. Select Guide. There will be a link to open it in a new window - click it. Then, leave the guide window open as you adventure. It'll update automatically. I used it, and I love it. I only wish that I had a second monitor on which to place it. Ever since I first discovered KoLmafia, this is the script I have been waiting for. I think I've got a bug report. I just got the SOCK and guide is telling me how to get through the Castle's Ground Floor, not the Basement as I expected. Yeah, I like the script that much. Sorry about that! I added in some preliminary support to try and fix that; run svn update. I'll look at it closer when I'm in-run. Glad you like my interface. It's a shame I can only run chat in a mafia window while I'm doing that. Well, my monitor is pretty big. I'll try to fit it my chatpane also. Gosh that's crowded. Will it actually fit a combat containing 3 florist friar plants along with manuel's information in my much reduced mainpane? Last edited by Bale; 01-21-2014 at 10:48 PM.